Hagen analyzed crash data before and after the implementation of 18 slow zones for his doctoral research paper, “Calming New York: An Examination of Neighborhood Slow Zones” [PDF]. He found no significant change in the rate of traffic injuries in the areas with slow zones compared to areas with no slow zones and similar street widths, street designs, and traffic patterns. In those 18 slow zones, overall traffic fatalities and injuries fell 10 percent, primarily among motor vehicle occupants. Injuries to people walking or biking actually increased 6 percent. The control streets saw statistically similar trends. In London, the effects of 20 mph zones were different, preventing dozens of fatalities or severe injuries each year, according to the British Medical Journal. Hagen credits the more intensive traffic calming measures installed in London. In New York, slow zones rely on three tools: pavement markings highlighting the speed limit, speed humps, and “gateway” signage telling drivers they are entering a slow zone. DOT later moved the gateway signs from the roadbed to the sidewalk, leaving the speed humps as the only physical traffic calming measure. More robust measures in the city’s toolkit, like curb extensions or expanded sidewalks, were not part of the program. This enabled implementation to proceed quickly, without involving the Department of Design and Construction, but at the expense of effectiveness. 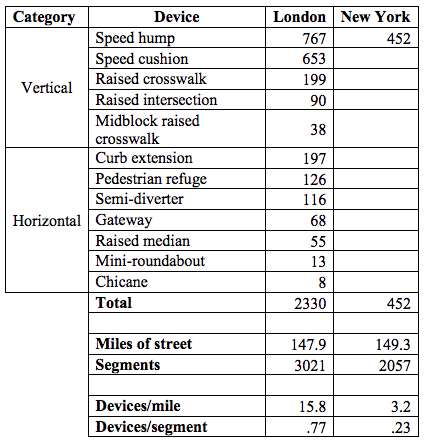 In comparison, London added raised crosswalks, raised intersections, curb extensions, pedestrian refuges, traffic diverters, mini-roundabouts, and other traffic-calming measures as part of its 20 mph zone program. And these interventions are installed at five times the rate per mile of street as New York’s speed humps. 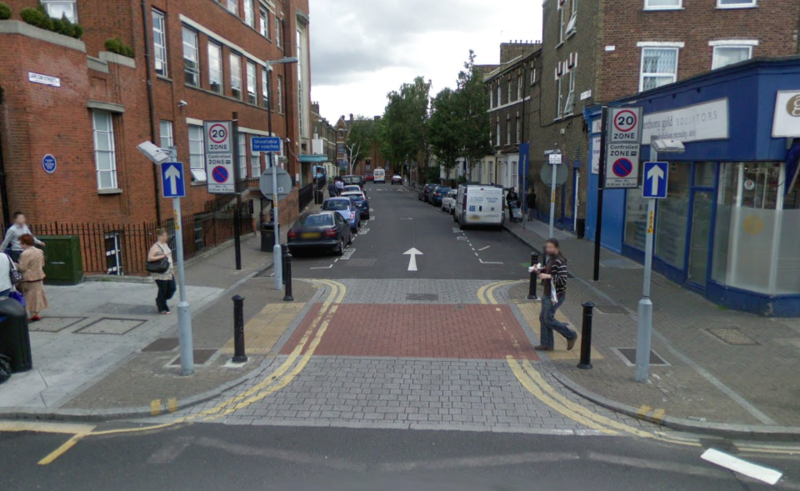 London’s 20 mph zone program consists of a robust set of traffic-calming measures. New York’s slow zones mainly consist of speed humps. Under the de Blasio administration, DOT’s focus has shifted away from the Neighborhood Slow Zone program and toward arterial streets. Given the agency’s limited resources, that makes sense, since major streets like Queens Boulevard and Fourth Avenue have higher rates of traffic injuries and fatalities than residential side streets. The slow zone program, which relies on speed humps that aren’t permitted on bus routes, didn’t touch wider roads. “The DOT has a pool of engineers that work on all traffic safety projects in the city, so when something like neighborhood slow zones becomes less of a priority, the agency will be reluctant to put precious resources on a lower-priority program because their pool of engineers is finite,” Hagen said. But smaller local streets are still places where people walk and bike, where kids play, and where traffic endangers people. As London’s example shows, a neighborhood traffic-calming program with sufficient resources can make a significant impact. Hagen thinks the Neighborhood Slow Zone program provides a good blueprint that the city should return to for neighborhood-level traffic-calming efforts. As a daily Brooklyn Bridge bike commuter — one of the most amazing things to observer, is the sheer volume of man hours dedicated to that retractable bollard. It’s been going on for practically 8 months, if not more. Often times, I’ll see crews of up to a dozen men (the occasional woman or two) working on it. I shudder to think of the aggregate expense for that mere bollard. In addition to that slab of concrete, they’ve also had a cruiser from the 84th stationed at the BK footpath entrance/exit for the duration. Every single time, they’re just sitting in their cruiser looking down at their phones. It’s easy to snark and call them lazy and what not. But the reality is, if your boss said, sit in a car for 8 hours and don’t drive or do anything. You’d probably do the same. Not in NYC. Less than half the households own cars. DOT's slow zone program was a standing offer to neighborhood groups: Here's a way to make your streets safer -- tell us that you want it and we'll make it happen. The same basic structure could be used to expand DOT's "shared space" initiative.